I’m now at the halfway point of my eight-month internship here in Punta Cana and there’s so much to talk about! For starters, I’d like to remark on the friendliness of most every employee I come in contact with on the hotel property. When I leave my casita in the morning and walk to the employee cafeteria, I probably pass on average about ten different employees, and it is extremely odd if even one does not look me in the eye and say hello or good morning. I am wearing my employee badge, so they know I am not a guest, and there is no need to try and impress me, yet they still give a hearty greeting. I am struck by this, even after living here for four months. Right now, there’s a tranquil, humid rain coming down outside and as I listen to the sound, it reminds me of the current changing seasons. When I arrived, I felt it was quite warm and humid, but it has actually gotten more humid as the months have moved past the winter season. Being from Northern Michigan, I am dreading the hottest months of the year- July and August- but luckily I have AC in my casita as well as the office, so I know it could definitely be worse! I was thinking I’d mention some things I do for fun, since I haven’t really talked about that. I’ve been here for a few months already and have made a small group of friends who are scattered throughout the Punta Cana region. I have a Dominican friend who works the reservation phone for Tortuga Bay (the luxury boutique hotel here) who I met on the bus going to Santo Domingo one weekend. I also am friends with the two local Peace Corps members who live right in the heart of the nearby Verón community. I’ve got random friends I see at the office during the day, and ones I eat lunch with Monday through Friday, plus the front desk hotel staff who I talk to quite often (as I spend a lot of free time in the lobby, using the wireless Internet). Anyway, for fun, I find myself visiting a nearby theater to catch a recent flick, or spending a weekend afternoon on the beach with a Peace Corps member or two, or organizing a group dinner at a friend’s casita or simply spending time alone, studying Spanish and watching movies on my computer. Sometimes I visit one of the jungle lagoons here for a quick swim, or I meet up with one of the Peace Corps volunteers in Verón (and I can really see how good I have it living at the hotel, since Peace Corps members live at the same income and lifestyle quality level as the locals!) There are a variety of hobbies I can take up here too- I can learn to dive at the dive shop and help them hunt the invasive species Lionfish in the coastal area, I can help at the PUNTACANA Ecology in one of their sustainable resources projects or I can spend a day volunteering at a local orphanage. As for my work activities, these are just as varied as my free time activities. 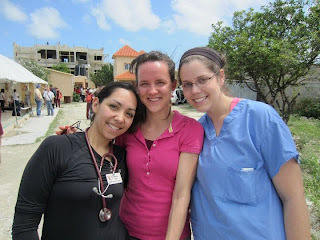 Specifically, one recent activity was extremely fulfilling- I spent a week with a large group of doctors and medical students and we set up makeshift clinics in the local community, and simply treated people as they came. I did a lot of patient flow management because we had to keep the huge crowd (plus the numerous kids underfoot) from milling about too much, wandering into different sectioned-off areas to curiously watching the examinations! I’ve also been working on the creation of a few different webpages for the PUNTACANA Foundation, and I am learning the public relations-related steps we need to take before these websites can be made official, since it represents the hotel corporation’s image. And just recently, I co-managed a group of VIP tourists from the U.S. for a couple hours. They were interested in seeing the free local clinic and one of the local schools that the PUNTACANA Group created. This was a lot of fun, since it involved my direct supervisor Margarita and I acting as a close-working team during the tour, and we both received a hearty applause at the end as the group thanked us for our leadership that day!